We Value the importance of Community and contribute where possible. The Starlight Children’s Foundation is a national children’s charity dedicated to transforming the experience of hospitalisation and treatment for seriously ill children and their families throughout Australia. Starlight’s programs deliver both in and out of hospital and are built on the World Health Organisation’s social model of health to support the well-being and resilience of these seriously ill children and their families. These programs are integral to the total care of seriously ill children – while the health professional’s focus on treating the illness, Starlight is there to lift the spirits of the child giving them the opportunity to laugh and play and be a child again. The EMPR Group Board made a commitment in 2010 to throw its full support behind Starlight and their Wishgranting program. This has been in both raising money via the annual City 2 Surf Fun Run and by also working closely with our technology partners Hewlett-Packard & Toshiba to provide technology products for the Starlight Express Rooms within hospitals across Australia. EMPR has been the Highest Corporate Team Fundraiser via the City2Surf for 2 consecutive years. In 2014 we raised $62,022 which brought our 5 year total of supporting Starlight to $123,398! With a goal of $200,000 or over 30 wishes in mind, we have a huge target of $76,602 for 2015! The Grange Old School Boxing Gym is a great deal of inspirational work for the sport of boxing. This includes training local school kids in self-defense and training young boys to become better men through the hard work and discipline which comes from boxing. Cancer Council NSW are the leading independent funders of cancer research in Australia, granting more than $54 million to cancer research, research scholarships and fellowships in 2013. Doctors and other health professionals – to help improve prevention, detection and treatment of cancer. Cancer patients and the general community – more than 100,000 Australians contact the Cancer Councils for information and advice each year, through the Cancer Council Helpline. Their early detection and prevention programs are similar to the aims of which the EMPR Group hope to achieve, we build activities for our staff by encouraging physical activity, and to eat healthier foods in order to reduce the risk of cancer. The EMPR Group could not be happier to be associated with the great lifesaving work which the Cancer Council Australia provides. The EMPR Group also involves itself in the annual Biggest Morning Tea to further raise funds for the cause. EMPR Group has for many years proudly supported the St Greg’s Celebrity Sports Dinner which is the most important fundraising event for St Gregory’s College. All money raised at this event bursaries or provides financial assistance to enable boys to attend the College who would otherwise not be able to do so. The Marist Brothers, staff and old boys of the College are proud of the opportunities that an Education at St Gregory’s provides its students. The Camden Junior Rugby League Football Club was established in 1971 and is one of the oldest junior clubs participating in the Group Six Junior Rugby League competition. The history of the club dates back to the early 1950’s when school boy’s football was being played in the district. The Camden club has now grown into one of the largest clubs within the Group Six Junior Country Rugby League. The Club provides a fun, safe, sporting and caring environment to develop the youth of the district with skills and lifetime friendships. The Camden Junior Rugby League Football Club has a proud history and continues to bring the local community together with players, officials, committee members, sponsors, volunteers and families working together to make the club successful both on and off the field. The Camden Junior Rugby League Football Club has a strong link to the Camden Rams Old Boys Inc. and the Camden Rugby League Football Club (Seniors) and will continue working together to improve the infrastructure to give all members better facilities into the future. EMPR is a proud partner of many businesses, charity organisations and even families, looking to make a difference in their communities. 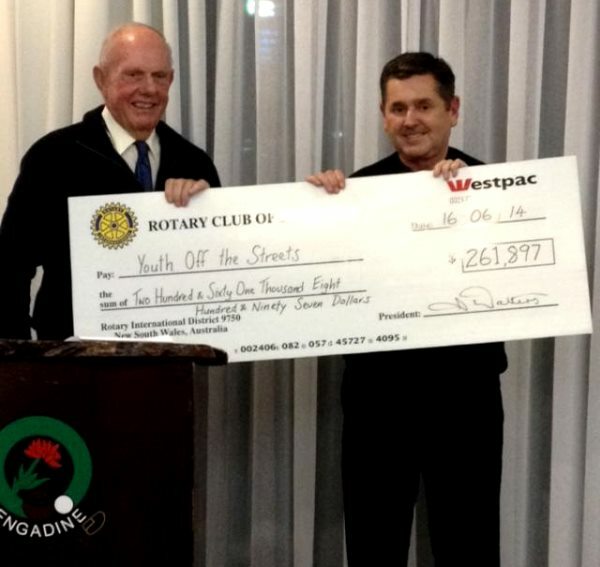 EMPR has been supporting the Cummings family in their work with the Rotary Club of Engadine to raise both awareness and funds for the Youth Off The Streets program run by Father Riley. Youth Off The Streets is a non-denominational community organisation working for young people who are homeless, drug dependent and recovering from abuse. They support these young people as they work to turn their lives around and overcome immense personal traumas such as neglect and physical, psychological and emotional abuse. Since opening in 1991, Youth Off The Streets has grown from a single food van delivering meals to young homeless people on the streets of Kings Cross, to a major youth specific agency offering a full continuum of care through delivery of a wide range of services. Each year Jamie and Debbie Cummings support the program via the Rotary Club Bicycle Ride from Sydney to the Gold Coast. As a proud partner of both Jamie and Debbie Cummings, EMPR not only donates funds which goes towards their fundraising total for the Bicycle Ride, but also donates IT Hardware to include in their pool of prizes for raffles that they hold at their event for further donations. Both Jamie and Debbie’s support of both The Rotary Club and Youth Off The Streets is truly inspirational.